It's been a long time since the last time I posted about food recipes. Due to my busy schedule between family, work, and holiday gatherings. Now, that everything is going in slow pace. I finally have time to cooked and blog about it (Yay!) Get that excitement coming because I'll be sharing my daughter's favorite dish, which is now my family's favorite. Can we all scream (Yumm!)? 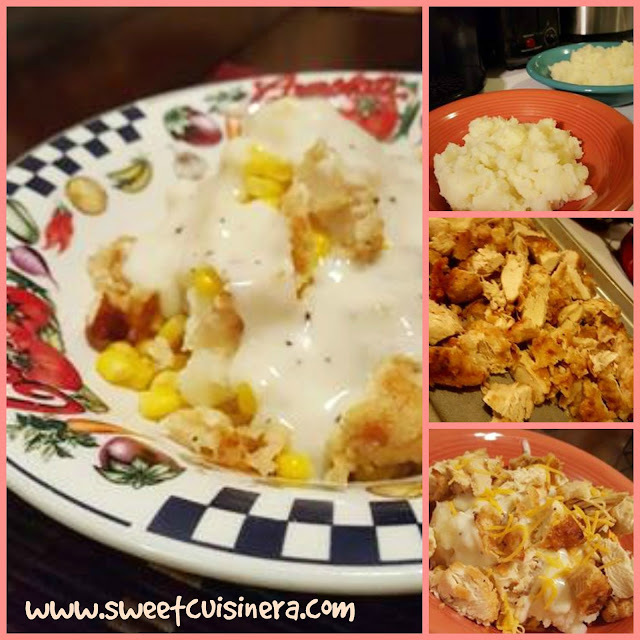 This recipe has everything you need for a perfect meal and indeed a crowd pleaser! I love how all the ingredients compliment each other and make every bite extra special. 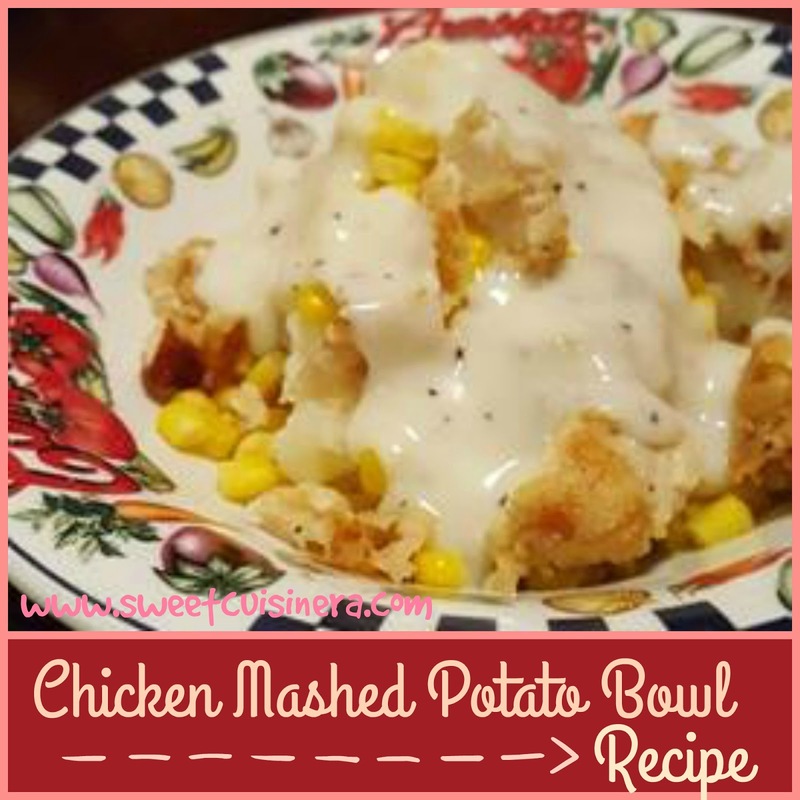 I hope this recipe gives you excitement because I will be sharing my own version of Chicken Mashed Potato Bowl. Its super easy to make and I promise you- this is going to be delicious experience. Are you ready to get started? If so.. Lets gather all the ingredients needed and start cooking! 1.) Seasoned the chicken breast with salt and pepper. Prepare the dredging station which consist of beaten eggs in one bowl and separate bowl for flour mixture. 2.) Put cooking oil on the pan. Start dredging the chicken into the egg mixture and then onto flour mixture. Set aside. 3.) Fry the chicken for about 8-10 minutes each side or until golden brown and crispy. Keep it warm in the oven. 1.) Peeled the Potatoes and cut into big cubes. Put water into a large pan and let it boil. Add the potatoes and let it cooked until the potatoes soften. 2.) Drained the cooked potatoes. Transfer it into a big bowl with butter, milk, and sour cream. Simply follow the instructions on the gravy mix. Super easy and quick way to make delicious gravy! Make sure that the corn is heated up. Chopped the fried chicken into bite pieces... And we are ready for delicious Chicken Mashed Potato Bowl. When making this Mashed Potato Bowl. I'd like mine to be in specific order, start it off with mashed potato, followed by corn, then chopped chicken, gravy and cheese. This is really worth all the work in the kitchen..and its SO good. A perfect comfort meal for the whole family for sure. That's not ALL. 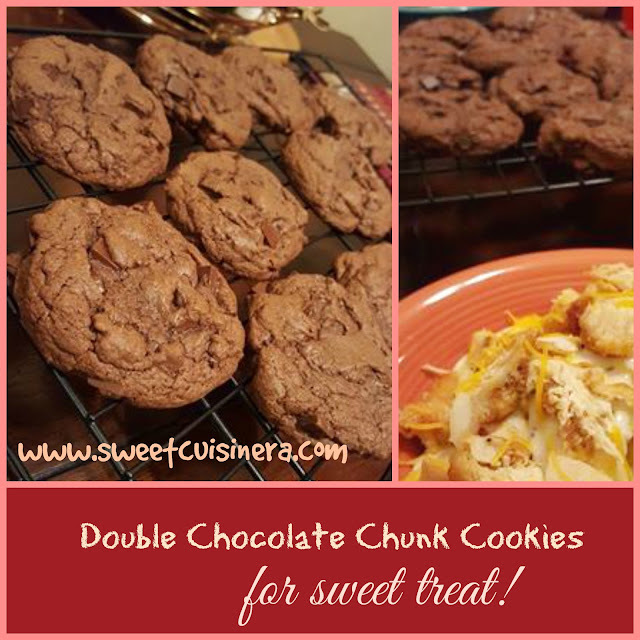 How about double chocolate chunk cookies? Yummo! I made this Double Chocolate Chunk Cookies to make our family dinner extra special. It soft, chunky, chocolatey, and delicious!